Our daily lives are ruled with the gaggle of connected home devices from smartphones to voice-controlled smart speakers. With that said, there’s nothing more annoying than streaming choppy videos or slowly loading websites due to a spotty Wi-Fi connection. So more than ever, it’s more important to outfit your home or business with the best wireless router to help ensure a fast and stable connection. For this post, we’ll guide you through some of the best wireless routers that should handle your current and future wireless networking needs. Here are some of the most frequently asked questions about wireless routers. These days, the most common way to set up a wireless network is to use a wireless router. Once you plug your phone or cable line into the router, the data will be sent through the connection to the router. The wireless router will then take the data and convert it into radio signals, which will then be picked up by Wi-Fi enabled devices like smartphones, laptops, game consoles, smart TVs, and more. A standard single-band 802.11n router can cost you from $25 to $100, give or take. A dual-band AC1200 model may set you back less than $100 but if you’re looking for an AC2400 router with MIMO streaming features, be prepared to pay around $100 to $200. For this buyer’s guide, we’ve researched and tested several of the most popular routers that you can find in the market. In order to come up with a list of wireless routers that will accommodate many different needs, we have chosen based on several factors like connection stability, speed, features, durability, and of course, price. We’ve also checked for reviews and feedback from verified buyers. After all, if a product has many good reviews, there’s a good chance that you’ll have a positive experience as well. So, we’ve done the hard part by researching and testing several devices so you don’t have to. Now, let’s get to the good stuff. Below are top recommendations if you’re looking for the best wireless router for your laptop and other devices. 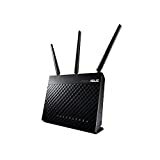 If you want a Wi-Fi router that has it all, the ASUS RT-AC68U (AC1900) comes highly recommended. This router is an excellent update to the top-notch RT-AC66U that came out the year before. The RT-AC68U (AC1900) is powered by a 1 GHz dual-core processor which helps in minimizing performance drops that happen in many home networks. The ASUS AiRadar feature is also great for boosting wireless connectivity using 802.11ac beamforming technology. This adds better coverage and increased stability to the router. The ASUSWRT User Interface is also worth a mention as it allowed us to install the unit easily and access some pretty robust advanced options. In terms of performance, the RT-AC68U (AC1900) doesn’t disappoint as it’s one of the fastest routers we’ve tested for this list. The ASUS RT-AC68U might be a bit tad overkill for most home but if you have an overly active network, this is an amazing router to consider. Netgear is known for their high-end routers and the NETGEAR Nighthawk R7000 is one of their more popular units. This is not surprising especially when the Nighthawk R7000 great performance and plenty of features for the price. Although the router features an extra bulky design, it also has a fairly solid build and a larger footprint that makes it easy to stay flat on a surface. It’s also wall-mountable which is not possible with the previous model, the R6300. In terms of performance, the R7000 impresses as well. On a 5GHz band and working with 802.11ac clients, the speed can reach up to 1.3 Gbps. However, on the 2.4GHz band, the router offers up to 600 Mbps of wireless speed, a definite upgrade to the old 450 Mbps. The router also features some impressive hardware components. We have the Dual-core CPU, 128 MB of flash memory for storage, and 256 MB of memory. The router also comes pre-loaded with its own built-in VPN server. The Nighthawk R7000 is another successful product from Netgear and offers plenty of features for taking one’s home network to a whole new level. As you can see, the TP-Link N450 has made the list mainly due to its price. The TP-Link N450 is an excellent router for less than thirty dollars. Upon getting our hands on the TP-Link N450 (TL-WR940N) we noticed that it’s smaller than most mid-range routers. It also has three external antennae which you can’t replace if one of them breaks. Overall, the looks and build quality are exactly what you can expect from a budget unit. Installation of the TP-Link N450 is very simple. All you have to do is to hook up the router to a PC and an internet source, open a browser and you will be directed to the router’s web-based settings. From here, you can adjust several Wi-Fi settings and set a password. It took merely 5 minutes to get everything up and running. For a budget router, the N450 offers better performance than other units in similar price ranges. We tested the unit in various distances and were about to achieve satisfactory speeds. Thus, this is a great router for online gaming and HD video streaming. It does lack key features like a dedicated phone line, USB ports, and parental controls. For less than thirty dollars, the N450 is one of the best budget routers available. The Netgear Nighthawk X10 AD7200 is a high-end option for those who don’t mind spending the big bucks. To put it bluntly, the Nighthawk X10 AD7200 delivers some of the fastest throughput performance we’ve seen in any of the routers in this list. In our close proximity 5GHz test, the router gave us an impressive 558Mbps which is faster than most routers in the similar price range. At a distance of 30 feet, the router scored 392Mbps which makes it an ideal router for larger houses or spaces. The Nighthawk X10 AD7200 is also a feature-packed router with six Gigabit LAN ports, two USB 3.0 ports, SPF+ LAN port, Ethernet Port Aggregation support, and more. For example, the Ethernet Port Aggregation support can make file transfers a whole lot faster to compatible devices. The premium price also extends to the hardware. The router is equipped with 1.7GHz quad-core CPU might seem like an overkill but it should protect you from any network downtime or connection drop-off. The only downside is that the MU-MIMO streaming capability isn’t the best considering the price. Savvy users will have a lot to like about the Synology RT2600AC. The RT2600AC is designed for anyone who’s looking to build a robust and secure home network. 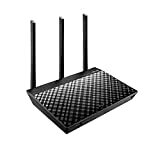 This router is a quad-stream (4x4) router and is capable of top speeds of up to 1,733 megabits per seconds when on the 5GHz band and up to 800Mbps on the 2.4GHZ band. In terms of performance alone, the RT2600AC is already looking good. The best thing about the RT2600AC is the firmware. Instead of the primitive way of managing the router through a web page, the router uses a firmware called Synology Router Management (SRM). The SRM firmware works like a modern operating system like Windows. Within the interface, you can open multiple windows, notifications, and so on. Of course, SRM allows you to configure various options. The router is configured like a computer system instead of just being a standard network device. This makes us believe that the Synology RT2600AC is aimed at more savvy users. The Asus Blue Cave AC2600 router is the product for you if you want something more stylish but still offers good performance and security. One look at the Blue Cave AC2600 and you’ll know that it’s not your average router in any way. The gaping blue hole in the middle lights up, and it looks more like a small speaker or sub. It’s definitely a conversation piece and should look right at home if you have a more modern-looking space. Setting up the Blue Cave is also a breeze using either the Asus Router app or its web interface. The interface lets you adjust various settings like setting up a guest network, changing the password, rebooting the router, and so on. The router also offers an in-depth QoS setting so you can prioritize which device can use most of the bandwidth. For performance, we’re happy to report that the router is not just all about looks. The speeds are actually impressive based on our tests. It also integrates well with Amazon’s Alexa if you have a device that supports the feature. For the most current and future use, the ASUS RT-AC68U (AC1900) is our top pick. It offers everything that you’ll want from the best wireless router and at a reasonable price. However, it’s hard to go wrong with the rest of our picks. Next articleLenovo Yoga 910 Review: What Is There To Love About The Lenovo Versatility?